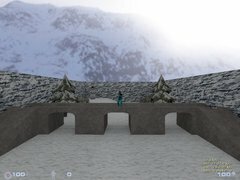 Last Man Standing: Last Man Standing (LMS) is a gamemode where all players fight each other like in deathmatch except that you don't respawn and the last one alive wins. Using more than 200 entities I have brought this gamemode to Sven Coop. In this map 30 fighters battle each other in a LMS-game. 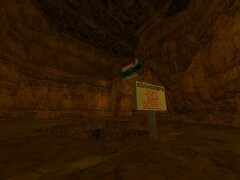 Up to eight players can participate and the rest of the slots is filled up with npcs. LMS-gameplay: All monsters attack everyone and each other. Players can and must kill each other. However they can cooperate for a while if they choose to do so. Watch out for backstabbers though! Up to eight players can play the game at the same time. Additional players can spectate. All killed players can spectate while the round is still going. The spectatormode is a little odd but I think it is still pretty decent for a game that has no hardcoded spectatormode. Ultra high difficulty: You spawn without weapons and weapons and other items are very scarce. Enemies do a lot more damage than in vanilla-HL. Most enemies will kill you with one attack. Completely random rounds: All players, NPCs, weapons and items are spawned completely random in the map. No boring itemspawn-camping. Awesome reward: If you manage to survive this brutal game and be the Last Man Standing then there will be an awesome reward for you! 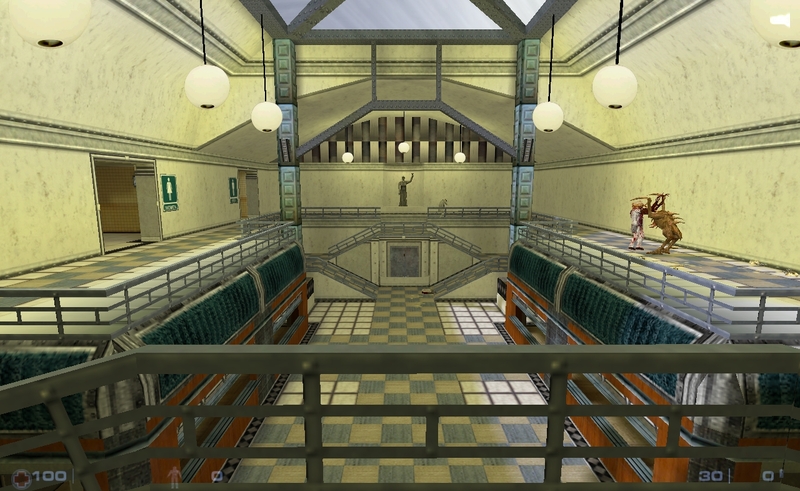 Old bathhouse scenario: This game takes place in an old bathhouse that has plenty of hiding spots and tactical possibilities. It is also quite good-looking I believe. This map does NOT work with XP-Mod! Please deactivate it for this map! 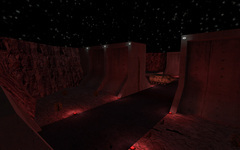 Prefab: I am working on a prefab of this gamemode so that you can also make LMS maps easily. It will be released "soon". The-Middleman really set the bar high for SC deathmatch/survival mode with this map, for 2013 it was really innovative and cleverly made. 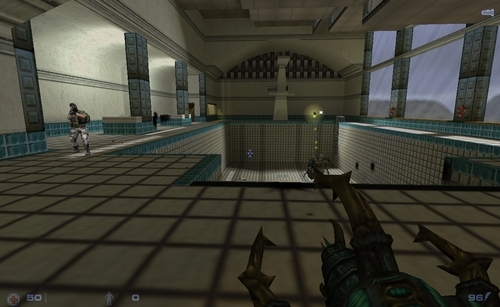 There are some bugs though, some acknowledged (such as the cubicle doors opening early, so you are "stuck" for 40 seconds rather than 20, which is constantly tedious) and some not, such as the semi-random spawning mode (or possibly just a finite number of monsters per round) so often either the whole map is filled with monsters and you've no weapons, or there's loads of weapons/ammo/armour/health but nothing to fight apart from other players. Often, it seems like the map is stuck in one mode or the other. Possibly some entity function changed since the map was made, breaking it, or maybe this was intentional behaviour - either way, it's not ideal. A proper random distribution of spawnables would be better, since currently it's either (unarmed) PvM or PvP/Nothing. The map architecture is well designed and nicely built, and looks just great! It could easily be a proper valve DM map since it's so well thought out and has a lot of linking routes, places to dodge, hide, attack and a variety of spots to lurk in. That doesn't mean you can hide out the round - if the map has decided to make monsters, within the 6 minute round you'll almost certainly be discovered and killed. There is another fairly major bug at the end of the round; if you play SP then often, at the end of the round, instead of becoming the winner (by default) the game often kills you as if there were other players still alive. Particularly annoying, if you have managed to survive the whole round only to be unceremoniously killed, as if you had failed the task. Not sure why weapons are given on player respawning and then immediately removed, I can't see any value in that - it's just frustrating and pointless. With some fixes, and maybe an optional change of game mode, this map could become great once again. In many ways, the spectator mode in LMS bath is far more satisfactory and fit for purpose than the current official method, in which you just noclip the entire map, which is very undesirable. Bugs aside, it's still a lot of fun to play, and it has great replay value due to the semi-random spawning, and the type/quantity of players. Give it a go! Great fun and refreshing gameplay! The map is good looking, has a nice amount of hiding spots and paths you can take to get out of a sticky situation. A glowing ball floats around the map spawning either a weapon or a monster in it's path. Staying too close to it in hopes of a weapon can backfire if a monster is spawned. The map's balance is excellent. High-damage monsters spawn very rarely and once you get a gun they are somewhat easy to defeat. You won't instantly die unless you are unlucky and run into the arms of a human grunt with a shotgun. You can outrun most monsters in this map. Or, if that doesn't work, trick them into chasing another player. Monsters roam around the map looking for players to attack, so sitting in a corner won't be a successful stategy for very long. Keep on moving and look for weapons, armor, and health packs around the map for the best chance of survival. Letting players start without a weapon is a great design choice. 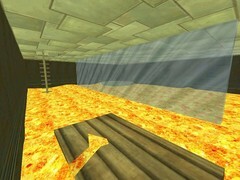 This forces players to run away from monsters early on in search of something to defend yourself with. And only having 1 life for every round keeps everyone on their toes. It's a lot of fun and very fresh gameplay for SC. The amount of weapons spawned through the map is very low, so don't waste ammunition on slow monsters. You need to co-operate with other players to have a chance of surviving. Atleast for a while. If your friends have weapons you want you can try and kill them and have it all for yourself. When the time of a round runs out the last player alive wins and recieves 100 points and a temporary trophy. If there is more than 1 player alive you will instead be punished. Then it starts all over again. For dead players there is a well-made spectator mode. 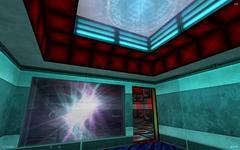 Stand in front of any of the screens in the spawn room in order to follow a random player in first-person view. If you wanna follow someone else you can easily step backwards and then walk into the screen again. There are some bugs in this map you should be aware of. Besides rare crashes, which can't be fixed in the map, there is an issue after someone wins a round. Players spectating will be stuck in spectator mode even after a new round starts. Killing your character should get you unstuck from spectator mode. There is no countdown for when a new rounds starts. So if you are stuck inside your box just keep waiting until you eventually spawn. The map is best suited for 4-8 players. I would love to see this game mode in other maps as well. This was a ton of fun - so many good design choices!